When the Egyptian-drafted UN Security Council resolution calling for a reversal of Trump’s decision recognizing Jerusalem as the Israeli capital passed by a 14-1 margin, Amb. Nikki Haley voted to veto it. 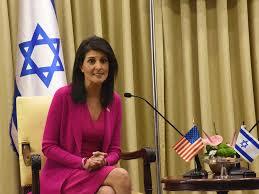 She made the following astounding threat (by Twitter, of course): “At the UN we’re always asked to do more & give more. So, when we make a decision, at the will of the American ppl, abt where to locate OUR embassy, we don’t expect those we’ve helped to target us. On Thurs there’ll be a vote criticizing our choice. The US will be taking names.” “We’re not going to be taken advantage of any longer,” Trump chimed in. “Taking names”: childish and gangster-like, I tweeted back. And “you don’t speak for me” or anyone else who wants a just Middle East peace, I added. This episode will probably be remembered as a classic in Trump administration foreign policy, exemplifying its bumbling diplomacy—alienation of friends, undermining of international institutions, and reliance on empty threats. Haley’s peevish display shows us once again that the real effect of “America First” is to put America last. Dr. Gurtov, your feelings and words express exactly the way Ann I felt when we heard that speech. Amb. Haley certainly does not represent us nor does that attitude reflect the way we feel about just Middle East peace efforts. “Gangster-like” says it all. We now have a gov’t like some in Africa and S. America, where the top rulers are in it solely on their own accounts. Haley may be too dumb to realize she is a Trump Family tool. opposition (note the recent Muslim declaration of 57 nations or whatever—surely you know of it), and reinforce negative American exceptionalism. It should be noted that, although Trump occupies the White House, he did not win a majority of votes in the Nov 2016 election and increasingly represents a shrinking minority. Yes, there is a “coup” underway, to use the Fox News fearmongering, and why not? DT damn well ought to be couped! Go Mueller Go. We already know that Haley’s little more than a mouthpiece. Absolutely, and much worse than Tillerson. Isolation story as we slide down the mountain.